The Centor Easy force gauges are designed to meet the production needs of its users. This group offers several features which are indispensable today for quality control, for example: ease of reading with its large backlit graphical display, RS232 output, memory of the last 100 values and ability to set thresholds with visual and sound alarms. Designed for use in an industrial environment, it is an ideal tool for tests during production. With its internal load cell, the Centor Easy force gauge can be used handheld for compression and tensile testing, and a large range of grips, platen and fixtures can be used for excellent testing performance. Find out more about our grips and fixtures. The Centor Easy digital force gauge can also be fixed to a manual or motorized test stand for finest and efficient testing application. Discover our test stand products line. The Centor easy force gauge saves the maximal values (up to 100 values) in its internal memory. An automatic statistics feature is available on the Centor Easy models: the minimum, maximum, moving average and standard deviation of the current batch are calculated and displayed after each measurement. All the values of the production batch are kept in the memory and can be sent to a computer. The operator is spared any data entry, knows his results in real time and saves everything at the end of the tests. 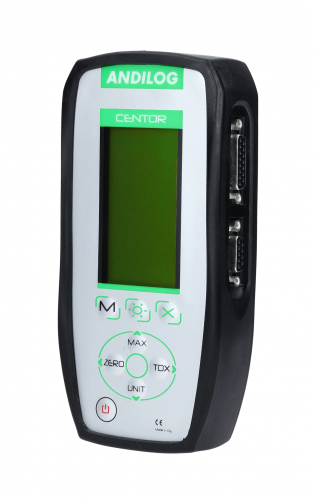 To ensure a perfect integration into the manufacturing process, the Centor Easy force gauge is able to communicate with external devices thanks to its inputs/outputs, available through the 15-pin connectors on the side of the force gauge. Integrated trigger input/outputs : 2 outputs and 1 input integrated trigger channel for a direct connection to a logic controller to sort “PASS” and “FAIL” parts by example.